Guide arm accessory is available for multiple adjustment positions of the hose or cord. 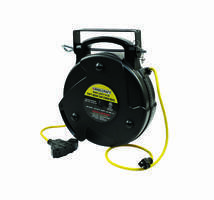 Hose reel models are offered with up to 1/4” x 25’ or 3/8” x 20’ air / water hose. 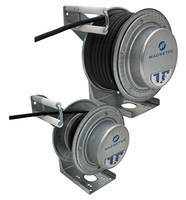 Cord reel models are available with 30’ of 12/3 cord with multiple cord ending selections including quad box receptacle. 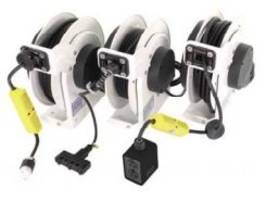 The Series LG Cord Reels come with quad grounded NEMA5-15 outlets with LED power “on” indicator light. The reel is offered with 65 ft of 12/3 cord or 75 ft of 14/3 cord. The light cord reel features a 1300 Lumen LED light, a grounded 12 A outlet and an on/off switch. The cord reels are ETL listed. 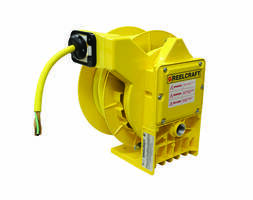 Reelcraft’s Series L NM400 Cord Reels come with guide arm that can be adjustable for 5° over a 270° arc to suit different applications. 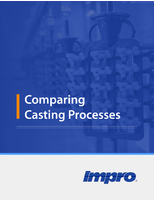 Units feature heavy duty cast aluminum design with yellow powder coat finish. 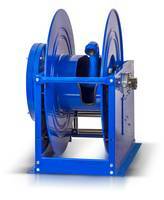 Reel’s containerized drive spring simplifies handling during maintenance process. 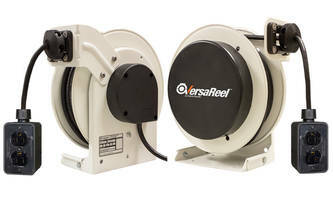 VersaReel™ Reel features separate mounting base plate. VersaReel™ Reel offer remote power to applications such as warehouses and maintenance shops. Unit comes with quick-change cable guide and multiple mobile end accessories. Reel can be mounted in locations like ceilings, walls and benches. RTA Series Cord Reels come with 125 Volts slip ring. COB LED Light Reel delivers light of 600 lumens. SLPL Spring-Driven Reels come with swept riser design. Enhanced with nickel-plated steel inline swivel, SLPL Spring-Driven Reels’ axle plumbing is available in both standard carbon steel and optional stainless steel models. Increasing the pressure rating from 250 psi to 1500 psi, unit’s nickel plated inline swivel comes with Coxreels® multi-lobe seals. Product feature less restrictive flow patch compared to 90° swivel. G9000 Series Hose Reels come with external drive spring. Designed for 1-1/2 in. I.D. x 50 ft. low pressure air/water hose, 1 in. I.D. x 75 ft. and 3/4 in. I.D. x 75 ft. medium pressure oil hoses, G9000 Series Hose Reels feature roller bearing inside of the pillow block for smooth spool rotation. Units come with removable gooseneck for easier hose attachment. Coxreels' is pleased to offer dual hydraulic reels! 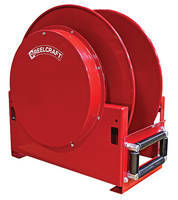 Magnetek Cable Reels can be mounted on moving machinery. For over 35 years our Wheeled Rod Guide Couplings, have been at work in oil fields across the globe. 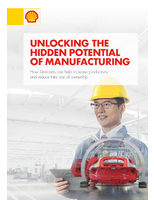 Our products are engineered to extend the service life of sucker rods and tubing, delivering cutting-edge innovation that enhances oilfield operation, maximizes output, and enhancing overall operations. 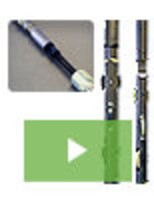 To learn about the advantages of using Wheeled Rod Guide Couplings in your wells, see our video. Fish Tape Power Winder facilitates tedious job. 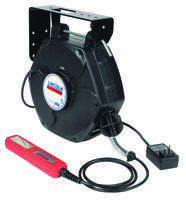 Retractable Power Cord Reels feature 30 A/600 V rating. 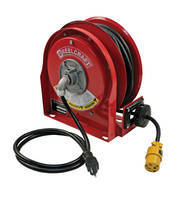 Hose Reel is rated from 3,000-10,000 psi and -60 to 250°F. 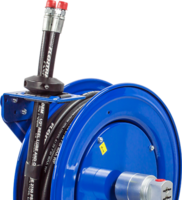 Self-Retracting Cable Reel suits static grounding applications.